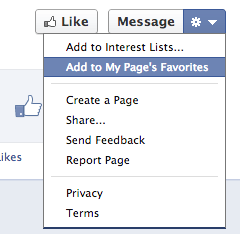 How do “like” Facebook pages “as a Facebook page” rather than as my personal account? I created a Facebook page for a company, and my personal account is the "admin" of that page. What I want to do is "like" some other pages, but I want to "like" them as this company's page, not as my personal account. I Googled around and found various videos and screenshots about how to do this, but they all pointed out buttons or links that don't seem to exist anymore. Facebook being what it is, it would seem that they've redesigned again and again such that those ways don't work anymore, so now there must be some new way... does anyone know the correct way to do this now? You can "like" a Facebook page as a page you administer. For this you need to log-in your account - Then go to the page you'd like to "like" as a page - scroll down until you see the option to “Add to My Page’s Favorites” at the very bottom on the left hand side. Now click this option and you’ll see a pop-up window, where you can choose from the pages you admin. Facebook have changed the method/interface for doing this slightly. To do this, go to the page you want to like, then click the "More" menu as shown in the screenshot below, then select the "Like as Your Page" option, then a popup box showing all the pages you administer, lets you choose the Page you wish to like the current Page with. I don't know, if my answer fits to situation Facebook has over two years ago (when this question was originally asked), but today this seems to be way simpler. Once you create a Facebook Page and login with your original account, you simply select Use Facebook as [page name] from Facebook's gear icon and then... you go, browsing Facebook and liking, whatever you... like. Any time you like something, it will marked as your Page's like, not your own account. You will even see a cleare message in your Facebook toolbar: You are posting, commenting and liking as [profile name] — Change to [page name] and vice-versa. The only obstacle is, that when you use Facebook as your Facebook page, many profiles, photos etc. my be blocked from being liked or shared by you. I'm not sure, but it seems, that you're limited to liking, sharing and commenting other Facebook Pages only. You can't do that on a regular Facebook profiles. You need to switch back to your original profile to do this. 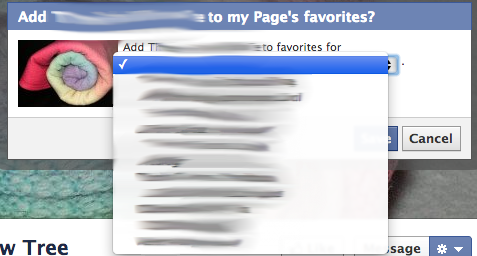 So currently there is no need to use Add to My Page's Favorites option. All you need to do, is to switch to use Facebook as your Facebook Page and like, share etc. just like normally. Can I merge a Facebook company page and an application? If I convert a personal account into a Facebook Page, what will happen to apps/pages I've created? How can I manage the transition from personal account to professional page? Can I stop notifications from a Facebook Page I administer going to my personal account?